The WebSockets MTP transfers USP Records between USP endpoints using the WebSocket protocol as defined in RFC 6455. Messages that are transferred between WebSocket clients and servers utilize a request/response messaging interaction across an established WebSocket session. Section 3 of RFC 6455 discusses the URI schemes for identifying WebSocket origin servers and their target resources. These resources are organized hierarchically and governed by a WebSocket origin server listening for WebSocket messages on a given port. USP Endpoints are one type of WebSocket resource that is identified and discovered. R-WS.1 - As the USP Endpoint is a resource governed by a WebSocket origin server, the WebSocket server MUST also be identified as defined in section 3 of RFC 6455. R-WS.2 - A USP Endpoint MUST be represented as a WebSocket resource using the path component as defined in section 3 of RFC 6455. R-WS.3 - When creating DNS-SD records (see Discovery), an Endpoint MUST set the DNS-SD TXT record “path” attribute equal to the value of the Websocket resource using the path component as defined in section 3 of RFC 6455. When exchanging the USP Records across WebSockets MTPs, the two USP Endpoints establish a WebSocket session. These WebSocket sessions are expected to be long lived and are reused for subsequent USP Record exchange. A WebSocket session is established using a handshake procedure described in section 4 of RFC 6455. When a WebSocket connection is not longer necessary, the WebSocket connection is closed according to section 7 of RFC 6455. The following figure depicts a WebSocket session handshake that is originated by an Agent. While WebSocket sessions can be established by either USP Controllers or USP Agents in many deployment scenarios (e.g. communication between USP endpoints across the Internet), in general, USP Agents will establish the WebSocket session and not expose an open port toward the Internet for security reasons. Regardless of which entity establishes the WebSocket session, at most one (1) open WebSocket session is utilized between the USP Endpoints. R-WS.4 - USP Endpoints that exchange USP Records MUST utilize at most one (1) open WebSocket session. R-WS.5 - USP Agent MUST provide the capability to originate the establishment of a WebSocket session. R-WS.6 - USP Agent MAY provide the capability to accept the establishment of a WebSocket session from a USP Controller. R-WS.7 - A USP Endpoint MUST implement the WebSocket handshake protocol to establish a WebSocket connection as defined in section 4 of RFC 6455. R-WS.8 - A USP Endpoint MUST implement the procedures to close a WebSocket connection as defined in section 7 of RFC 6455. 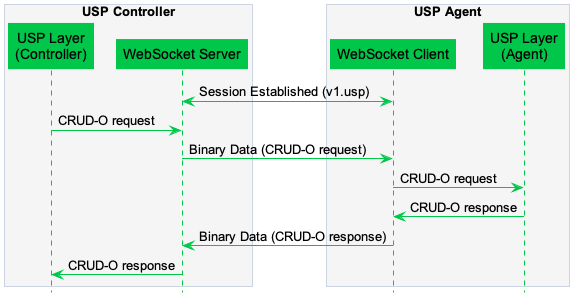 During the establishment of the WebSocket session, the WebSocket client informs the WebSocket server in the Sec-WebSocket-Protocol header about the type of USP Records that will be exchanged across the established WebSocket connection. For USP Records, the Sec-WebSocket-Protocol header contains the value v1.usp. When presented with a Sec-WebSocket-Protocol header containing v1.usp, the WebSocket Server serving a USP Endpoint returns v1.usp in the response’s Sec-WebSocket-Protocol header. If the WebSocket client doesn’t receive a Sec-WebSocket-Protocol header with a value of v1.usp, the WebSocket client does not establish the WebSocket session. R-WS.9 - The WebSocket’s handshake Sec-WebSocket-Protocol header for exchange of USP Records using the protocol-buffers encoding mechanism MUST be v1.usp. R-WS.10 - A WebSocket client MUST include the Sec-WebSocket-Protocol header for exchange of USP Records when initiating a WebSocket session. R-WS.11 - A WebSocket server that supports USP Endpoints MUST include the Sec-WebSocket-Protocol header for exchange of USP Records when responding to an initiation of a WebSocket session. R-WS.12 - A WebSocket client MUST NOT establish a WebSocket session if the response to a WebSocket session initiation request does not include the Sec-WebSocket-Protocol header for exchange of USP Records in response to an initiation of a WebSocket session. RFC 6455 defines a number of type of WebSocket control frames (e.g., Ping, Pong, Close) and associated condition codes in order to maintain a WebSocket connection. In addition messages are transferred in WebSocket Data control frame. R-WS.13 - A USP Endpoint MUST implement the WebSocket control frames defined in section 5.5 of RFC 6455. USP Records can be transferred between USP Controllers and USP Agents over an established WebSocket session. These USP Records are encapsulated within a binary WebSocket data frame as depicted by the figure below. R-WS.14 - In order for USP Records to be transferred between a USP Controller and Agent using WebSockets MUST be encapsulated within as a binary WebSocket data frame as defined in section 5.6 of RFC 6455. R-WS.15 - USP Records are transferred between USP Endpoints using message body procedures as defined in section 6 of RFC 6455. 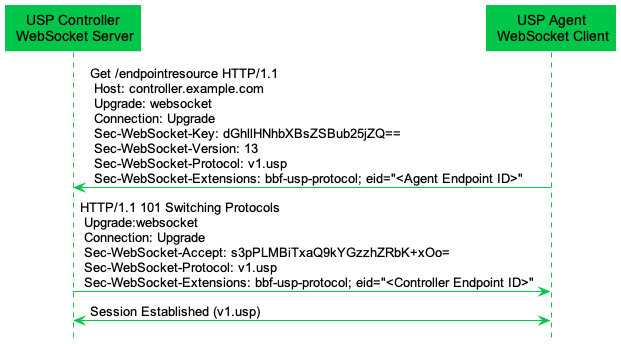 If a USP Endpoint receives a WebSocket frame containing a USP Record that cannot be extracted for processing (e.g., text frame instead of a binary frame, malformed USP Record or USP Record, bad encoding), the receiving USP Endpoint notifies the originating USP Endpoint that an error occurred by closing the WebSocket connection with a 1003 Status Code with the WebSocket Close frame. R-WS.16 - A USP Endpoint that receives a WebSocket frame containing a USP Record that cannot be extracted for processing, the receiving USP Endpoint MUST terminate the connection using a WebSocket Close frame with a Status Code of 1003. Once a WebSocket session is established, the WebSocket session is expected to remain open for future exchanges of USP Records. The WebSocket protocol uses Ping and Pong control frames as a keep-alive session. Section 5.5 of RFC 6455 discusses the handling of Ping and Pong control frames. R-WS.17 - A USP Endpoint MUST implement a WebSocket keep-alive mechanism by periodically sending Ping control frames and respond to Pong control frames as described in section 5.5 of RFC 6455. R-WS.18 - A USP Endpoint MUST provide the capability to assign a keep-alive interval in order to send Ping control frames to the remote USP Endpoint. If for any reason a WebSocket Session is closed, the USP Endpoint will attempt to re-establish the WebSocket Session according to its session retry policy. For Controllers, this session retry policy is implementation specific. For Agents, the retry interval range is controlled by two variables (described in the table below): the minimum wait interval and the interval multiplier. The corresponding data model parameter MAY be implemented to allow a USP Controller to change the values of these variables. The factory default values of these variables MUST be the default values listed in the Default column of the table below. R-WS.20 – Once a WebSocket session is established between the Agent and the Controller, the Agent MUST reset the WebSocket MTP’s retry count to zero for the next WebSocket Session establishment. R-WS.21 – If a reboot of the Agent occurs, the Agent MUST reset the WebSocket MTP’s retry count to zero for the next WebSocket Session establishment. WebSocket MTP message encryption is provided using certificates in TLS as described in section 10.5 and section 10.6 of RFC 6455. R-WS.22 - USP Endpoints utilizing WebSockets clients and servers for message transport MUST implement the Certificate modes of TLS security as defined in sections 10.5 and 10.6 of RFC 6455. R-WS.23 - USP Endpoints capable of obtaining absolute time SHOULD wait until it has accurate absolute time before contacting the peer USP Endpoint. If a USP Endpoint for any reason is unable to obtain absolute time, it can contact the peer USP Endpoint without waiting for accurate absolute time. If a USP Endpoint chooses to contact the peer USP Endpoint before it has accurate absolute time (or if it does not support absolute time), it MUST ignore those components of the peer USP Endpoint’s WebScoket MTP certificate that involve absolute time, e.g. not-valid-before and not-valid-after certificate restrictions. R-WS.24 - USP Controller certificates MAY contain domain names with wildcard characters per RFC 6125 guidance.